Today we introduced a new product from Esri – ArcGIS Hub. ArcGIS Hub supports collaboration between government, businesses, citizens and their communities to accomplish data-driven initiatives. A few early adopters are using ArcGIS Hub today and the product will be generally available in late summer. ArcGIS Hub introduces a new framework for effective and open government. The Hub is organized around initiatives. These are patterns for accomplishing community and policy goals using data, tools, analysis, teams of colleagues and the community. ArcGIS Hub offers premium capabilities, Initiatives and Community, for designing and adopting a growing network of Initiatives as well as public participant management tools such as engagement tracking, event planning and communications. These capabilities extend ArcGIS and require a new, optional license to enable for your organization. 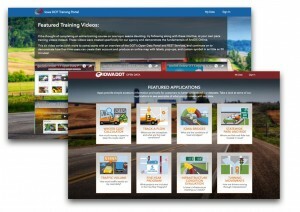 You can learn more about the complete ArcGIS Hub product at esri.com/hub. ArcGIS Open Data remains a freely included and powerful capability of the ArcGIS platform. Within minutes, anyone can publish authoritative data through custom designed websites and pages. ArcGIS Open Data sites are now created and managed in ArcGIS Hub – starting our existing ArcGIS Open Data publishers on the journey to becoming a Hub for their communities. Over 8,000 organizations have enabled ArcGIS Open Data since its launch in 2014. These governments, universities, NGO and other organizations have shared over 70,000 datasets globally that are freely accessible by the public in easy to use explorable maps, charts, and tables and are downloadable using open formats and developer APIs. 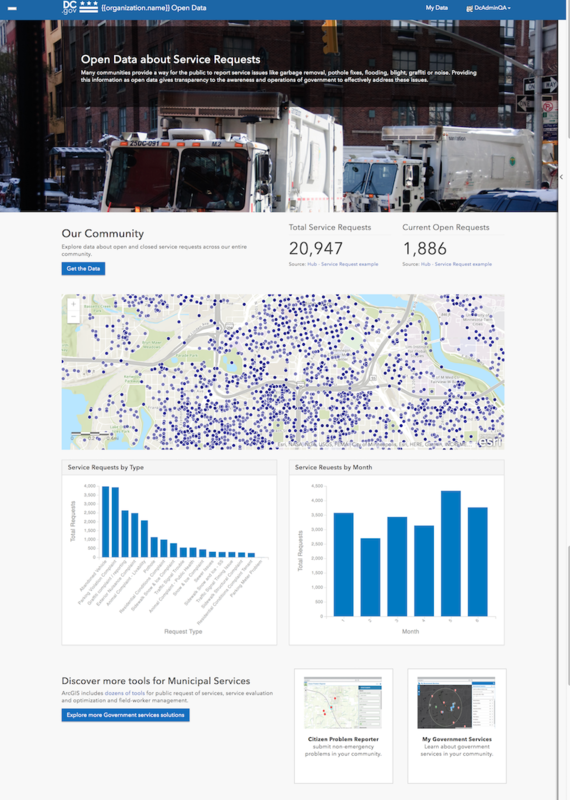 ArcGIS Hub shares open data, create and join initiatives and manage community engagement. ArcGIS Hub introduces a new framework for effective and open government. Initiatives are patterns for accomplishing community and policy goals using data, tools, analysis, teams of colleagues and the community. All organizations can start with the open data initiative today. 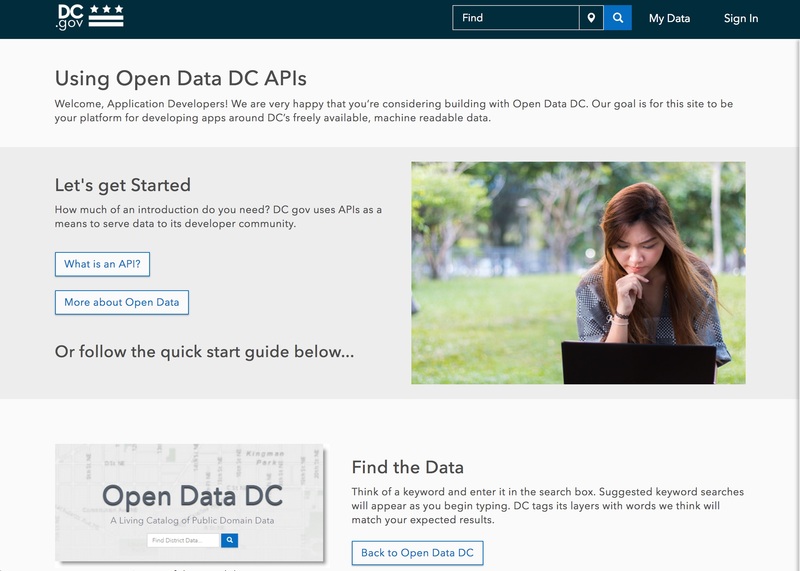 ArcGIS Hub walks you through launching your first open data site and recommends meaningful open datasets to share that align with commonly used open standard data models. Once you adopt the open data initiative and link your data to requested indicators, you are contributing to a global catalog of standardized open data. Each indicator page includes maps and charts linked to your live open data that help the public quickly understand the current status of service requests, addresses, financial budgets and spending. You can also configure a data request survey to ask constituents what data and tools they would like to see added to your open data site. This is a simple way to prioritize data that your community would use to answer important questions. One amazing aspect of ArcGIS open data is that these 70,000 datasets are published from the operational services that the government itself uses for daily operations and planning. 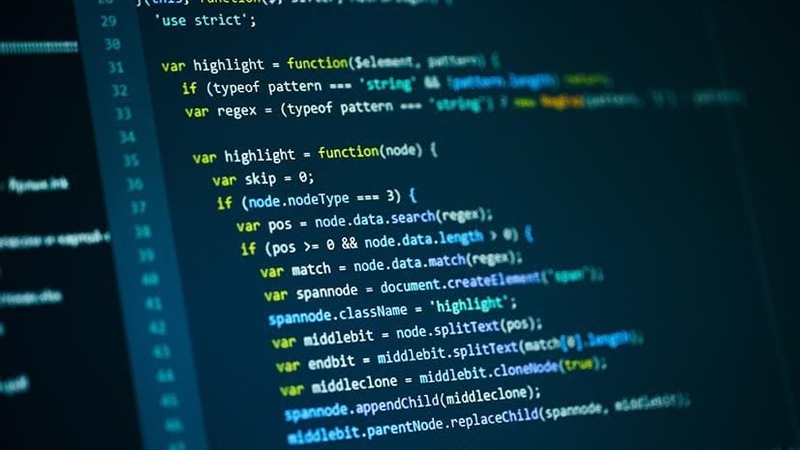 Open data is most sustainable when it is integrated and part of the operational, enterprise data management systems that enterprises are already use. National agencies like the US Department of Homeland Security, national governments of Kenya, multinational groups like World Resources International, states such as Arizona, departments like Iowa DOT, cities including Halifax, and Medellin have all shared their open data without any additional infrastructure or new platforms to purchase or manage. Last year when released ArcGIS Open Data 2.0, a major feature of the release was the entirely new and revolutionary ArcGIS Page layout engine. We combined modern web design experiences and graphical layout tools with data-driven capabilities for live charts, maps, and galleries. This provides you with easy website building that replaces the need for expensive and custom web coding. Organizations are streamlining their departments to use Pages for sharing performance dashboards, data and apps with the public. 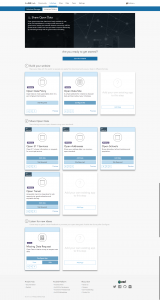 Pages are also being used for internal only use-cases to coordinate information and apps that are useful for work management and monitoring. Sites and Pages support granular access controls and publishing workflows as well as cross-departmental sharing. Organizations can create unlimited Sites and each site can have unlimited Pages – all hosted in our fully-managed cloud-scale platform. 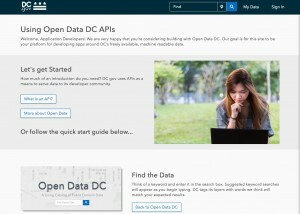 Washington, DC created an ArcGIS Page for the developer API and open-source libraries. 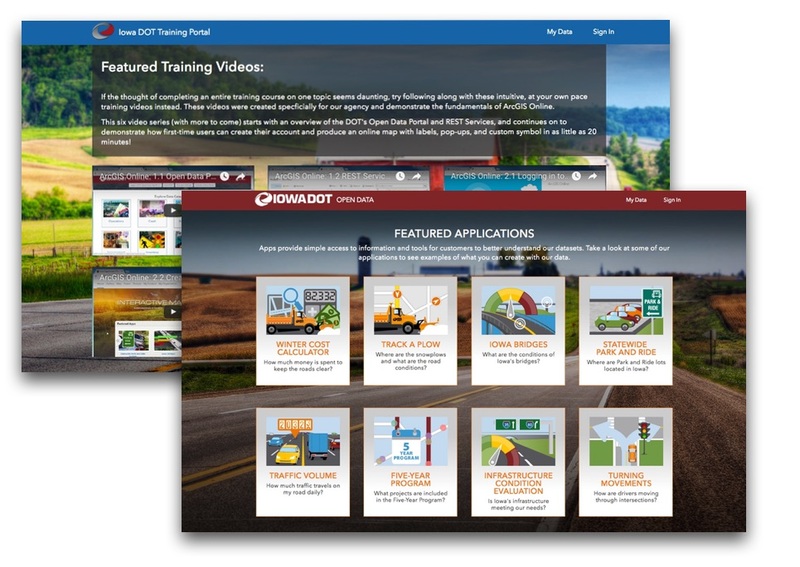 Iowa DOT uses ArcGIS Pages for data and staff training. ArcGIS supports spreadsheets, documents, media, and apps along with geospatial data. Government transparency includes sharing financial data such as budgets and spending so that constituents can monitor and provide feedback on purchasing and operations. This year, open data also added support for connecting content – starting with webmaps. When you share an webmap with your open data groups, they will be linked from any dataset that is used in the webmap. This starts building an information network between raw data and derived analyses that help the public understand its context. Anyone in the public can also create their own webmaps and StoryMaps to share their own perspective – but this community content remains independent of authoritative data and information. We will release updates to ArcGIS Hub every week and it may be difficult to track all of the new capabilities, improvements and bug fixes we include. So we are now publishing our regular changelog so you can see major updates with each release. We are also always listening and would love to hear your ideas for open data in our GeoNet forum.